Day 7: Start something that you know will be difficult and thus have been avoiding. Doesn’t matter if it’s ugly, as all art starts out ugly before the artist finds the beauty in it. I am tired of living this boring life, he thought, as he lifted the dining room chair and deftly manuevered the vacuum cleaner, sucking up the leftover flakes of the croissants he had baked for Jacinda. He found some fulfillment in managing their home and in his daily trips to the local Manifestival arena (Just last week he defeated Artemisas in wrestling. Jacinda seemed proud and pleased that her husband had established himself as the one of the strongest men in their town) but he felt something was missing. Why should the women be allowed to work outside the home and travel for business and earn their own paychecks, but not men? He had always loved doing the crossword puzzles in the newspaper and enjoyed writing letters for correspondence…he had once written a short story in school that had earned him high marks and he had been elated until the teacher remarked that it’s too bad that men don’t work in the arts., he would likely have been a good writer. Best to stick to mens’ work, using his natural strength. History had shown that women were smarter and better able to manage complex projects and large groups of people. Leave the easier work, like domestic engineering, to the men. 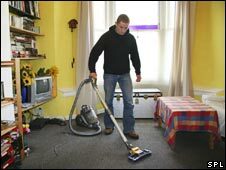 He set the vacuum cleaner down and thought of the essay he had submitted to their city newspaper’s non-fiction contest, using his initials so the editor might assume it was a woman writing. The deadline was last week and he constantly checked his mailbox for some sort of notification. His daydream was interrupted by the sharp shrill ring of their kitchen phone.